"Project plan, project timing, installation process, cleanup, electrical inspection - all aspects went according to plan. Steady..."
Project plan, project timing, installation process, cleanup, electrical inspection - all aspects went according to plan. Steady communication from sales was excellent. "Careful work, confirmed performance and documentation. On time arrival and completion. " Careful work, confirmed performance and documentation. On time arrival and completion. "We have had overall wonderful service and responsiveness. It is about training and sending us the first time the people who can..."
"Excellent communication and a better feel of quality and care of how we felt about our project. Went out of the way to meet our..."
Excellent communication and a better feel of quality and care of how we felt about our project. Went out of the way to meet our needs! "Very nice technicians and efficient service." Very nice technicians and efficient service. "We have several questions and would like to have someone call us." "While I tell people interested in putting solar on their house that my experience so far is good, I realize that I should have..."
While I tell people interested in putting solar on their house that my experience so far is good, I realize that I should have gotten a second and maybe a third bid. I tell others to do this. Until the tax credit goes through and I can see the electric savings, I don't know if I would hire you again. "Really, all of it went well. When you're good, you're good. Keep it up. " "The small "extras" you did for me. " "Planning (responsive and complete); Execution (rapid, creative and careful); Follow through (every detail attended to, no..."
"Very responsive and professional salesman with no "pushy" tactics. Very hard-working installation crew. Manager quickly responded..."
Very responsive and professional salesman with no "pushy" tactics. Very hard-working installation crew. Manager quickly responded to problems. By Sharon & Gary N.
"Salesman, Kevin Pilcher, worked very hard to get our system installed before the end of the year." By its name alone, you know that “renewable energy” has to be a good thing. While fossil fuels like oil and coal require labor and fuel to be extracted from the earth, and even more energy to be refined and transported, solar and wind energy is simply available for the taking. It’s no wonder that more and more people are interested in harnessing these natural renewable resources. As a full-service renewable energy company, our focus is on providing you with a comfortable home for less. Halco offers a wide range of renewable energy options for residential and commercial buildings in and around Rochester, Ithaca, Syracuse as well as Webster, Fairport, Auburn, Cortland, Canandaigua, Pittsford. We install solar power and electricity, wind power, solar heating and geothermal heat pumps in Yates, Ontario, Cayuga, Steuben and Seneca Counties. Why is it a great time to invest in a renewable energy system? Clean & green; no air pollution or greenhouse gas emissions. Rebates are available to offset system installation costs. Major energy savings after a renewable energy system is installed. “Off-the-grid” capability during power outages. Solar energy may not only save you money each month, but in addition, investing in solar has the potential to increase the value of your home. Political instability in oil-producing countries, combined with increasing global demand for fuel, is continuing to drive up the price of fossil fuels. This makes renewable energy more attractive. 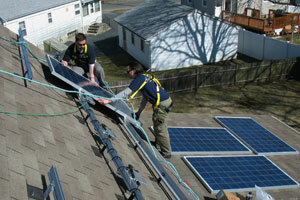 Lower installation costs for renewable energy systems. Which renewable energy system is best for you? This type of renewable energy system is also referred to as solar electricity or simply “PV.” PV technology turns the sun’s radiant energy into electricity that can power household appliances directly, charge a bank of batteries, or feed back to your local electric utility (earning you credit on future grid-supplied power). Also called a solar hot water system, this technology harnesses solar energy to produce hot water that can be used for whole-house heating, washing, or both. The availability of wind energy varies greatly. But if conditions are right, small-scale wind turbines are available to produce “free” electricity with the same usage options available for PV power. Sometimes referred to as a “ground-source heat pump,” this system combines the heat-exchange power of refrigerant technology with the steady temperature of the earth at depths below 8 ft. or so. A geothermal heat pump is powered by electricity but can be three times more efficient than other HVAC systems. Geothermal HVAC typically provides heating, cooling and hot water for washing. No separate water heater is required. It often makes sense to utilize more than one renewable energy system. For example, many homeowners are choosing to install geothermal systems that can be powered at least part of the time by solar electricity. Dan seems to know the system inside and out very impressive. Thom and all the phone staff have been very prompt, concerned, and helpful during this stressful time. I'm glad to be home to a comfortable home. Thom did a great job of explaining what I could do to make my heating & cooling system more efficient. When the time comes, HALCO will be at the top of my list. Zack was great to work with on our solar system today. He and his partner did an excellent job and they were a total pleasure to work with. We were totally satisfied and pleased with his competent and friendly service. Thom was very friendly & helpful - He explained what needed to be done and why thank you so much for your excellent service. Great phone staff; the technical staff had been polite clean, experienced, and energetic. Thom has consistently been polite, professional, and helpful - a great asset to your company. Great job, efficient; friendly customer service. Thanks Tom! This employee is keeper! My family and I were very please with our first meeting with HALCO personnel, especially Thom Mayo. The technician that came to the house were very courteous, knowledgeable and helpful. We have been very pleased with the service we have received. Thom also gave me clear explanations. Our experience of working with Halco has been excellent. We have no hesitation recommending them based on the work they have done for us on our new house. Halco did all the plumbing on our new house and also designed and installed our solar/PV electric system. We had been considering geothermal heating and would definitely have gone with Halco but decided not to install it in the end (we did 'stub in' radiant piping in our basement floor to allow an upgrade to geothermal if our wood stove proved inadequate. Right now our house (which is straw-bale post-and-beam) is proving to be very energy efficient and even the stove is hardly necessary.). Halco's renewables group has been outstanding to work with and seems to consistently hire remarkable people: smart, articulate and very customer/user oriented. Everyone, from managers to installers were knowledgeable, efficient and reliable. Based on our positive experiences with Halco doing the solar/PV for our house my wife went ahead and convinced her business partner to install solar on their office building. Halco's plumbing people were also the best we have ever worked with as homeowners- and over 30 years we have dealt with our share of plumbers. They got the job done in a timely fashion, were responsive to our concerns and flexible when it came to the inevitable glitches in schedule and unexpected situations. As always service is A+ and professional. Thank you. Very helpful with all my questions! Halco's Renewable Energy Division specializes in designing and installing clean, reliable renewable energy systems for residential clients throughout Central NY - including the Ithaca, Rochester, and Syracuse metro areas. Specifically, we specialize in solar electric, wind electric, solar heating, and geothermal heating systems. These systems are reliable, responsible, and more affordable than ever. With our extensive knowledge and significant experience designing and building these systems in NY, we are excited to meet your needs and make your home more comfortable and sustainable. We are your resource for renewable energy in the Finger Lakes including Ithaca, Rochester, Syracuse, Auburn, Webster, Pittsford, Cortland, Canandaigua, Fairport, Penfield, Geneva, Brockport, Spencerport, Hilton, and the surrounding cities and towns. We also install insulation, energy-efficient water heaters and provide heating and cooling, plumbing and electrical services. Schedule a home energy assessment and let us diagnose your energy issues today!